DD all geared up for first day of school today. Spotless shoes which most likely will turn blackish by the time she comes home. Mine are going back today too. It's been a wild week! My WW post is here. back to school there now..geeesh that is a shot vacation.. I'm dreading not to go back to school when I was younger..lol especially after vacation..
Awww! I hope she has a great day! And that her books don't give her a sore back! wow!!! nice shot, you have indeed a very wonderful picture, keep it up!!! the kids here will have school by tomorrow already and how they wish it's still Christmas, lol, Love your DD's bag..
happy new year and ww! Love the pair of spotless shoes! May 2008 be even better for you than 2007. You know kids can't keep their things tidy. Hope first day in school went great! Best wishes to you and your family for the New Year, wishing you good health, happiness and a fulfilling 2008! Hope back to school wasn't too bad. Happy New Year to you both! I hope she has a great first day and year!! Love the shot! White never stays white long at our place either - LOL! There is a very girly feeling to it, I love that picture! I can never understand how they carry these heavy backpacks...but they do!!! I love this shot...all lined up and ready to roll...hope her first day is fabulous!!! She can't go wrong with "pink"! looks like someone is really excited for school! love the pink and black backpack and the pink tabs of tape on the sides of the photo. Very cool. Back to school day is always an exciting one! Happy WW! This afternoon we will do a study in shades of grey, too! This time of year. What fun stuff to go back to scool with. God bless. i hope the bag lasts her long enough!! hope the bag last the princess til year end! Great shot; that is why I rarely buy all white sneakers. How good you took a picture of that beautiful shining white spotless shoes, they probably never will be the same after her first day in school! I like the backpack, my niece would love it, too! My daughter has been on maternity leave for a year. Today is first day back teaching at the university. I'm sure she has a similar picture. What a cute idea for a picture. Hope the shoes aren't too blackish when she returns! Cute backpack! My kids are home until next week. I like having them home, but we need a schedule again so we can sleep sometime. Thanks for visiting my WW, that picture was actually some sort of lily pad at the zoo. Well since we homeschool my kids are back to work here today too BUT the kids in our public school systems got another day off due to SNOW! I hope she has a good day back. Happy WW! Thanks for dropping by. I remember those days. Great shot. LOL, I remember I hated to wash my shoes when I was a school girl. But when I did, I would apply a lot of white starch on them. As they got dirty, I shook off the starch powder. Reminds me of my school days when I carried heavy books. Oh yes, I think you might be interested in my latest post. Cute bag!! Happy New Year and Happy WW! Great shot. I hope those nice new shoes don't get too dirty! My WW pics are up at Siani's Pot-Pourri. Great shot!! LOL about the shoes!! Wow. Those shoes are so spotless. . . I had to go back to school today too. I hope she had a wonderful day. Thanks for stopping by and Happy Wednesday! It's amazing how heavy those bags get, isn't it! Happy WW! Your picture definitely captures the moment! 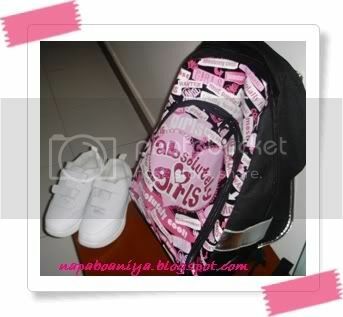 I love the girly girl backpack. We are heading back to school tomorrow, too. Good luck! Those shoes would not stay that color for more than 5 minutes with my kids. Happy WW. Thanks for visiting. How cute is that. It really is wordless when your child goes to school. Very cute backpack too! I don't miss school at all. Awww school days! Hope she doesn't get a hernia from all those books! Mine returns on Monday and he is not looking forward to it. As a teacher it's nice to see the first day of school prep from the other side. Thanks for sharing.